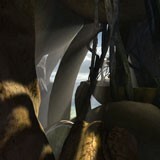 ups: Great looking and creative environments; details are nothing short of fantastic; lots of puzzles to solve. downs: Incredibly slow paced; puzzles can be confusing and quite hard; sometimes it's difficult to tell where to point and click. 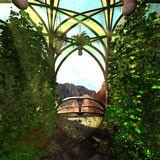 When I was first told I\'d be reviewing Myst III: Exile, I thought to myself, \"That\'d be great! That\'s cool! I can\'t wait! 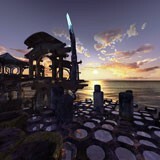 Uh, what the heck is Myst III: Exile?\" It didn\'t take long to find out the answer to that question. The only thing I really knew about it was that it was evidently the third installment of the series. In the many years of my spacious gaming career I have nary invested a single minute of puzzle-solving madness in a Myst game until now, so I had no idea what I was getting myself into. It turns out that Myst III: Exile is one of the most prodigious puzzle games I\'ve ever played, and it\'s a pretty darn good-looking puzzle game at that. In cautious anticipation, I slapped the game into my Xbox and viewed the intro. \"Cool\", I thought. \"The music sure does sound good.\" Then the menu screen popped up and I was told to start a new game. So I did, and the game proceeded. \"Is that a mouse pointer I\'m looking at? A point and click game, on a console? Why am I playing a point and click game on my Xbox?\" I almost dreaded what I would be accomplishing (or trying to accomplish) in the next several days of my life, as I feared I was in for the most boring gaming hours I\'ve ever experienced. What happened after that is difficult to say. Upon first playing this game I was strangely enchanted by solving oodles of very odd, almost abstruse puzzles in diverse awe-inspiring settings. Then it became a tedious exercise in navigating the landscapes and just simply knowing what to do next. However, Myst III is all about (and nothing but) puzzles. One of three things will happen to you during or after playing this game: You\'ll be so gleaming with an abundance of happiness at having witnessed and solved some of the most toilsome and ingenious puzzles ever created that you may attempt to play through the game again; you\'ll get so bored with pointing and clicking that you\'ll sink into a heavy, sleep-induced coma, or you\'ll be cursing so often and profusely that the game will probably end up taking a forced trip through your paper shredder and then hammered into even tinier unrecognizable bits. Fortunately for me (and probably my editors as well), I didn\'t experience the latter. What I did experience was a fairly mediocre game full of lots of attractive things to look at and pretty places to see and travel to, but a game that ultimately lacked excitement and replayability, and did little more for me than help me decide that I don\'t want to play another point and click game on my Xbox-ever. Did I mention there are lots of puzzles to solve? But you don\'t just waltz around various worlds deciphering puzzles for the fun of it. There\'s quite an expansive story that started way back in 1993 with the original Myst game. But if your like me, and have never resorted to playing a Myst game, you have no idea what that story is or has been to this point. Nor do you need to know. Like most games\' sequels, Myst III: Exile can live and breathe on its own, but it\'s definitely an extension of its predecessors. If you really want to catch yourself up on the story, go play Riven first. But, I\'ll spare you the agony and energy of having to do that and just tell you all you really need to know here. Simply put, the story focuses on Atrus, who decides to try and create a new world via inscribing a new book. Before Atrus can complete his pet project however, a mysterious thief breaks in to his laboratory and scurries off with it, which is where you come in. Your job is to hunt down this thief by exploring worlds that were written by Atrus earlier in his life and solving numerous amounts of mind-bending puzzles. By resolving these puzzles you begin to unravel the ambiguous relationship between the thief, Atrus, and his family. As I mentioned above, this is a point and click game, so anyone who isn\'t endowed with a good deal of patience, should save themselves some pain and grief and play something else. Even those who are a little more tolerant may have a difficult time getting used to the unorthodox method of moving around the differing worlds and the incredibly slow pace of the game in general. Also, it can get burdensome trying to decipher where exactly to point and click next, as the paths in some places are indiscernibly confusing. God bless the zip option, which is a very nice feature, letting you travel faster through areas that you\'ve already visited, speeding up the game a bit. It\'s not that the point and click adventure genre is a bad thing, just that on a console it seems a little out-of-place. Graphically, the game is an absolute marvel. Everything from the rocky crags of J\'nanin to the lush forest of Edanna, it\'s all very life-like and realistic. Nothing is overlooked in detail, and the puzzles themselves ooze with design and beg to be solved, however cryptic they may seem. In this sequel, the pre-rendered drawings have been replaced with a fully 3-D environment, which allows you to rotate and look in all directions, which is a really nice addition and serves to make it more interesting. Unfortunately, since this is a Myst game, you advance one still shot at a time, so you get the sense of being stuck inside of a photograph, rather than moving around in a full-blown, living, breathing landscape that you can manipulate as you see fit. This method of advancement gets expeditiously stale, and I\'m constantly finding myself wanting to break free of this \"one step at a time\" approach and take control of my character and traipse around the environment at my own free will. This adds to the frustration, and just makes the game unnecessarily dull and boring. On a lighter note, I\'m always up to a good, orchestrated score, and Myst III: Exile\'s is no exception. As was briefly mentioned, I really enjoy the wonderfully composed music, as it\'s very authentic and unique and really set the mood of the game. However, most of the time the music takes a low profile, getting muffled down to nothing more than an eerie pastiche of groans and blurbs in the background. The accompanying sound effects are wonderful, from opening creaky old doors, to summoning a critter out of its burrow, to cranking wheels of various kinds, and interacting with a variety of flora and fauna, it\'s all here and is credible and convincing. But those sound effects seem a little too infrequent to really enjoy all that much. The controls are as simple as it gets. If you can breathe, you can control this game. You do little more in the game than pointing and clicking, although there are books you collect that you can read by pressing either left or right on the d-pad to turn the pages. Unfortunately I have no idea what some of these books say, as the writing is about as easy to read as Arabic. The contents of the main book are actually printed in the back of the game manual as well but it\'s hardly any easier to read. Your inventory is located along the bottom of the screen and holds such items as books and journals, or sometimes just a sheet of paper with a symbol on it. You can drag these items from your inventory to the game screen when appropriate, which I suppose lets you do more than just pointing and clicking, but I honestly don\'t find any of the three all that stimulating. After hitting the start button, you have a few options such as toggling vibration on or off, switching to free-look mode (which basically means using the cursor or not), enabling zip mode, and watching the special features, which is nothing more than a 22-minute documentary on the making of Myst III: Exile if your interested, which can be watched in bits, or all at once. I can\'t help but think that this game was made for die-hard fans of the series, which is great if you\'re one of them, but if your not a fan of Myst games by now, Myst III: Exile probably won\'t persuade you to start being one any time soon. Had this game been created with a moving character that was able to run about freely, it would have improved tremendously and would be more palatable by non-Myst fans. Instead, I\'m at the mercy of yesterday\'s technology and the painfully slow \"click-and-look\" play mechanics, which left me feeling a bit underwhelmed and with a feeling of constant frustration. 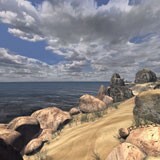 With its slow gameplay and dreadfully difficult puzzles, Myst III: Exile may satisfy patient gamers who consider themselves expert puzzle solvers. For all others, if you actually feel the urge to solve puzzles that would have stumped Einstein, get a hold of the book first and rent this one instead; or better yet, buy the PC version and play the game the way it was meant to be played. But don\'t say I didn\'t warn you. You may need a new paper shredder by the time you\'re done with it.